Described as social playground of art, design, music and ping pong innovations; Pongathon is table tennis in a party atmosphere. The accent is on the social aspect of the sport, creating harmony and goodwill by arranging tournaments or whatever on a light hearted basis. Following the Eurovision Song Contest, staged in the Ericsson Globe in Stockholm, Sweden; an even bigger party was held. 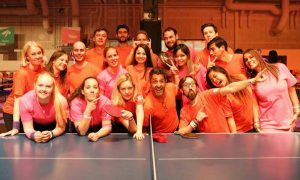 Pongathon took over Stockholm to lay on probably the largest social ping pong event in Sweden for the King organisation. A light hearted occasion, a chance to try table tennis, a chance to enjoy table tennis was organised. King is a company that produced “Candy Crush Saga”; a video game. Naming themselves the “Kingsters”, they participated in team based tournament in Stockholm’s Stockholmsmässan, the largest event and conference venue in Europe. Live music from a spaceship was arranged with dry ice also being pumped out to add to the atmosphere. Supported by the Swedish Table Tennis Association, an enjoyable event was enjoyed by all.